Their Willow Kit is really, really lovely. Willow herself gives us the clues as to the essence of the kit. When I look at this miss, as well as this kit, I see a few things right away. The main eye-catching coral/peach color, its calm aqua/blue/grey counterpart and the importance of patterns other than floral. 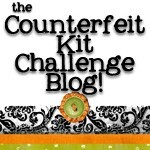 Felicity Jane kits are known for their gorgeous florals, but it appears to me that they have been downplayed this month. And I like it! Just like her hair and her dress, there is a wispiness to this kit that I really like. It captures a sense of free spirit - nothing much weighing her down, just a light touch of color. Check out the other lovely patterns shown here, and add just a sweet touch of florals if you must. That should capture the gist of this kit, just as easily as Miss Willow reaching up and waving a hand at you to say – hello lovely, won’t you play along with us this month.